The light will flicker through the open windows of this Belleek cottage candle holder. The Belleek China candle holder features an embosses thatched roof along with a vented chimney and an opening in the back so that you may insert the included tea light. 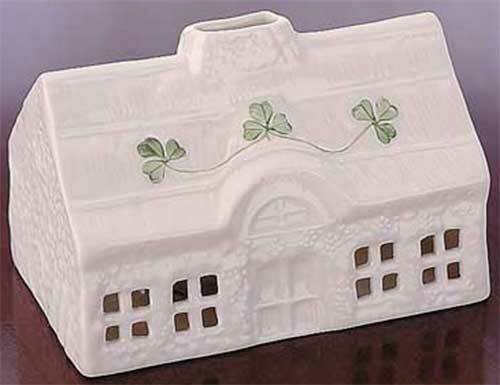 The Irish candle holder is enhanced with Belleek's famous hand painted shamrocks and it measures 5 1/2" wide. This Irish cottage candle holder is handmade and hand painted in Belleek, Ireland and it is gift boxed with a shamrock history card, complements of The Irish Gift House.